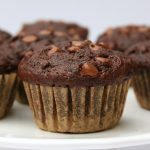 These muffins are unbelievably moist and they taste so decadent and chocolatey that you'd never guess the secret ingredient is zucchini!! To a large bowl add the shredded zucchini, oil, buttermilk, sugar, eggs and vanilla. Mix these ingredients together until they're well combined. Sometimes it's easiest to break up the eggs into the mixture with a fork first and then finish off the mixing with a wooden spoon. Add the flour to the bowl, along with the cocoa powder, baking soda, salt and cinnamon. With a wooden spoon or rubber spatula, mix all the ingredients together just until combined. Add the 1 1/2 cups of chocolate chips to the batter and fold them in carefully without over-mixing, reserving the other 1/2 cup to sprinkle on top of the muffins if you wish. Divide the batter evenly between 24 muffin cups and sprinkle the remaining chocolate chips over the tops of the batter. While the batter is still raw you'll be able to see little pieces of zucchini peeking through, but as soon as the muffins have baked the zucchini should disappear almost completely. Bake the muffins at 350 degrees Fahrenheit for about 24 minutes. Test them by inserting a toothpick into one muffin and if it comes out clean, they're done! Remove them from the oven and let them cool in the muffin tins for 10 minutes before removing them to a wire rack to cool completely. It's a wise idea to wait to enjoy them until they're at least cool enough to hold in your hand, but these are SO yummy when they're still warm and the chocolate chips are melted and soft.